We're still a few days away from the first of December, but the excitement and anticipation of Christmas is definitely in the air! I'm breaking out the tubs of holiday decorations today. I can hardly wait to get started. And you can tell that I spent time with Megan over the weekend, I just love my festive holiday header! 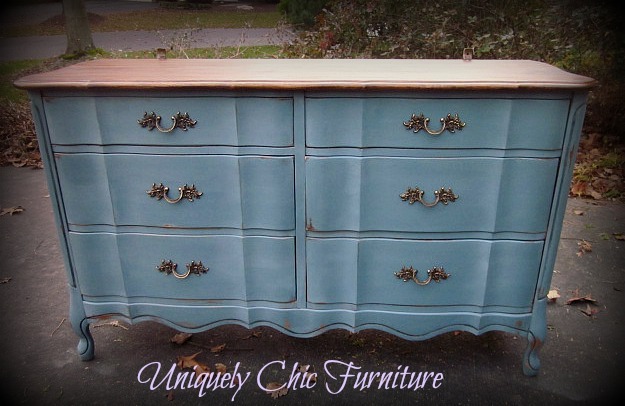 Sue from Uniquely Chic shared this curvy blue dresser with a gorgeous wood stained top! I have the perfect spot for this one! 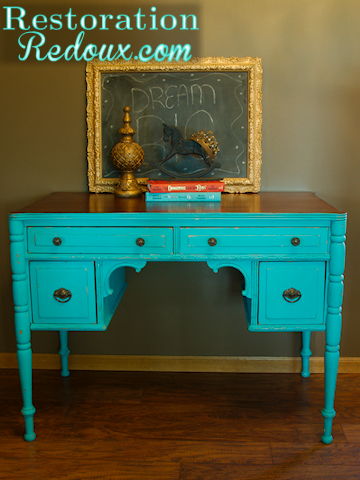 I love this beautiful antique desk transformation in turquoise from Shanna at Restoration Redoux! 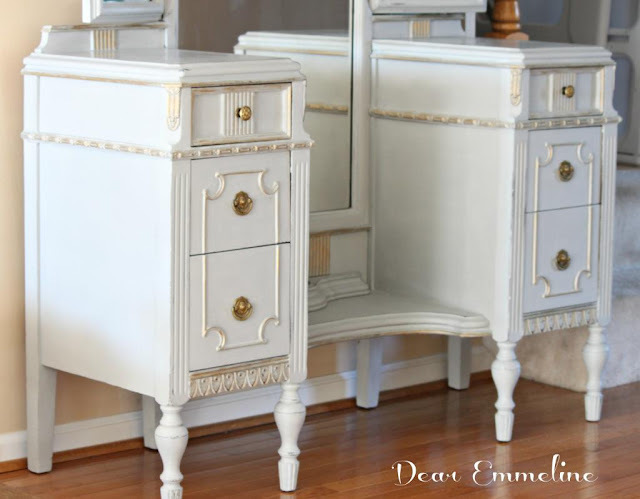 And seriously, can be believe that this stunning vanity from Dear Emmeline started out as a bulk trash rescue? It's A Wonderful Life was the inspiration for this beautiful old window project from A Few Pennies! And Santa provided the inspiration for a couple of chair painting girls! This whimsical Santa came from Deb at Lake Girl Paints. While A Vintage Fairy was inspired by a more traditional Santa! Then Angela at Number Fifty-Three took a heavily distressed classic chair and added a modern twist with a chandelier stencil! And how beautiful is this Tart Cranberry Cheesecake with Macadamia Nut Crust from Stephanie at Sweet Boutique? I bet it just melts in your mouth too! Thanks so much to everyone who linked up and linked back! Seriously, I know how busy you are right now! If you've been featured, feel free to grab a cute little button from the sidebar! Wow Sharon the features this week are absolutely amazing! awesome features!!! i featured all those chairs, too- they were just too cool! Thank you so much for the feature, Sharon! Have a great week! Thank you so much for hosting Sharon! Your Holiday header is great. OMG, you have so many gorgeous features this week! I love the furniture makeovers in particular! Thanks so much for hosting Sharon. Fabulous features! Have a great week. All three of those chairs are amazing. I love how everyone has something new to offer on a standard wood chair. Like a blank canvas, and I never tire of seeing what people have come up with. Happy Decorating today! Great chairs in the features (great everything else too!). thanks so much Sharon for including my vanity with all of your lovely features! great features! I love the chairs (I love anything and everything chairs) and I love the window project! Sharon, Love all the features. 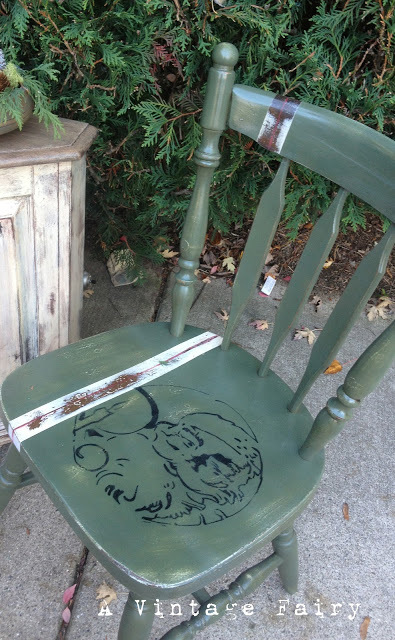 I really like the stenciled chair. Casual yet dressed up! My first time sharing at your party this week! Thanks so much for hosting! I'm now following you! Cool chairs! Thanks for hosting. Hope you had a great Thanksgiving! Hi Sharon: Wow--what gorgeous featured projects this week! I have some chairs to redo, so this was very inspirational today for me. Thank you for hosting, and I hope you have a great week. 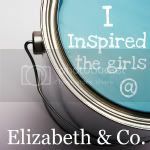 gorgeous features - I'm especially in love with the wonderful life project - ahhhhh! happy day to you!